The summer of 1863 was a violent one for New York City. As Civil War is raging, Abraham Lincoln institutes a military draft. However, for the cost of $300, men could purchase a waiver to prevent them from being drafted into the army. $300 is a year's salary for the poor Irish immigrants of the city and as hatred and resentment brews, so does the violence as it comes to a head for five agonizing days in July. 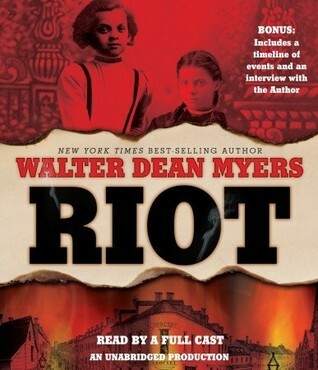 Riot tells the story of the animosity that existed between the Irish immigrants and the blacks of this time period, but Myers brilliantly uses this opportunity to tell about a rather obscure part of our history through the lens of a character who is caught in the middle. During this time, fifteen year old Claire, who is half black and half Irish, is torn between the two warring sides and must now begin to forge her own identity and discover a strength she didn't know she had. Riot was written in screenplay format which can be off-putting and difficult to follow for some readers. However, listening to this book on audio eliminates any confusion or frustration because it is read by a full cast. In fact, I'm pretty sure that if I had just read this book as opposed to listening to it I wouldn't be praising it as highly as I am. The full cast presentation along with the soundtrack made this novel-in-screenplay feel like you were actually watching a movie instead of listening to an audiobook. For those of you who weren't sold on the reading experience, I highly suggest giving the audio a try. I think your minds will be changed.